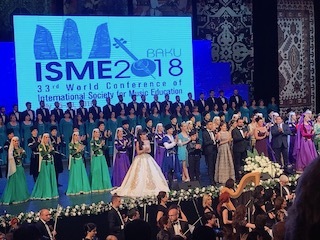 yesterday evening we had a pleasure of enjoying a beautiful concert as the official opening ceremony for the conference, held at the Haydar Aliyev Palace. The program, the musicians and dancers with a wide variety of styles and ages, starting from a very young pianist, Jamil Sadizadeh. The dancers and singers had made very finalized program to also express some idea of the local culture. I felt honored to experience this all. Thank you Baku! The conference, located in two main buildings, Hilton and Music Academy, is now fully running. The Prime program seems interesting, and the participation for the sessions has started actively. Besides the conference, the City of Baku also offers a lot of interesting to see. Often the possibilities for such issues are challenging, but this year we succeeded to join a tour at the Old City, guided by a young man as his first clients. I hope they will succeed in their business, as they really had a very good comprehension for the needs of the customers.